There are products from SUQQU that come out as super duper limited edition that I give up any and all hope of scoring. (First imagine my utter delight and rubbing of Evil Snow Woman Twig Hands when this generous parcel landed from SUQQU's PR team.) This Designing Color Eyes 102 Yuufujiiro was a counter exclusive in Japan at Shinjuku Isetan. Every once in a while, these very limited items end up making a second debut in the UK. Lucky for those of us that 1) never even aware this made a splash at one counter in Japan and/or 2) knew but gave up all hope. Of course, the cynical amongst us know that even when available, limited edition items are dauntingly difficult to get. But just to share release information, 102 Yuufujiiro will be launching on June 29th (along with a LE Extra Glow lipstick 103 Tsuyazakuro) at Selfridges, Harrod's and Fenwicks. Both Selfridges and Harrods do have SUQQU on line, but they are unreliable with available stock. I recommend contacting the counters directly via phone or emailing to reserve. I've covered the formula before. They are very soft and smooth. All pans have shimmer in them. The tonal combination of this particular quad is very soft and pretty while not lacking in pigment. 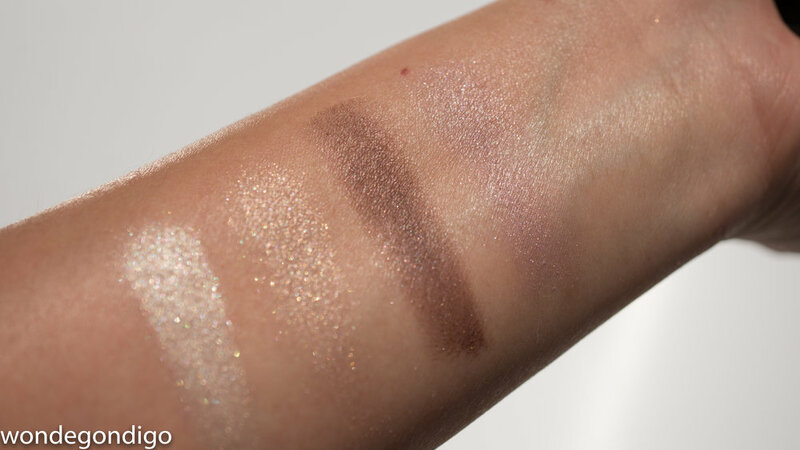 warm shimmery ivory, a bright highlight shade. the kind you'd typically want to use in the inner corner. It is near metallic, but not overly blingy. warm rusty peach with gold shimmer which intensifies in direct light. deep and warm plummy brown. 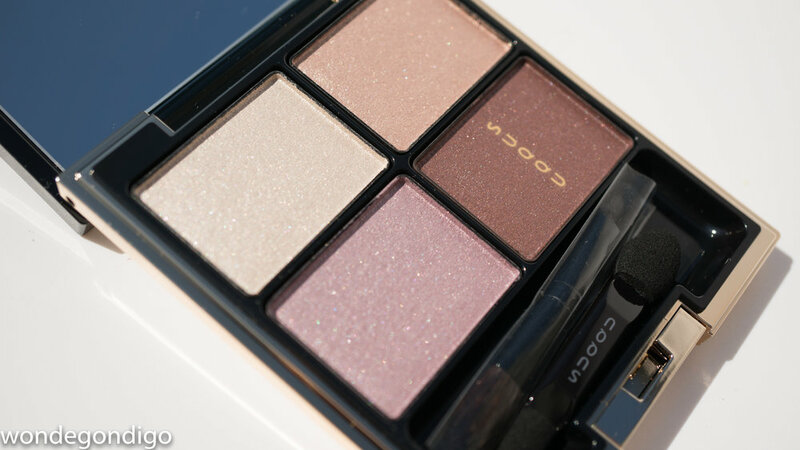 Nicely pigmented and makes a terrific liner shade or creating a smoky eye. soft shimmery muted lavender. These swatch photos turn the shade warmer than it is. I love this as the all-over shade. Very pretty and it holds its own against the darkest shade. I've first smudged black eyeliner along the upper and lower lash lines, as well as tight-lined. I used the darkest shade from the quad and brushed along the black to create an intense and smoky effect and blended softly to create a gradient. I used the lavender as the main lid shade, but made sure to blend into the top of the dark plum brown to create a well-blended, gradient look. I used the ivory just in the inner corner to brighten the look. I used the peach shade above my crease, mainly at the outer thirds. I also applied the darkest shade and the lavender shade in a gradient along the lower lash line. I'm wearing a bunch of things to spackle my face, of course. I think if you like muted soft shades in a palette that has the ability to impart some depth with a dark shade, and shimmery finishes, this would also be right up your alley!